The Animal Medical Center is one of America's most prestigious veterinary facilities. It sits in the center of New York City. It is a seven-story building with one-hundred full-time veterinarians and another hundred veterinarian residents. 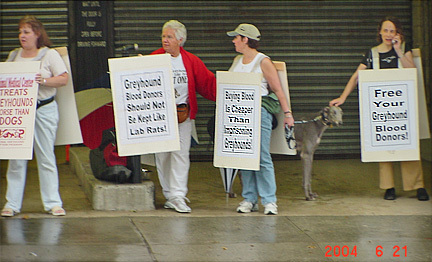 In 2004, National Greyhound Adoption Program was informed that the AMC housed greyhounds for the purpose of using them as blood donors. That small bit of information ultimately ignited a flaming giant in my heart that I wanted to change. I visited The Animal Medical Center on April 14, 2004 and was initially impressed with the grand facility - that is until I saw their greyhounds in what I would call their 'prison ward'. I have written about this so-called tour/inspection at great length and you will find it as you read through this documentation. My crusade to free these greyhound blood donor dogs from the Animal Medical Center began as a letter to them, evaluating my visit. It didn't take long for me to develop a sense that they did not care about what I thought, nor did they plan to do anything about it. Only one thing was achieved in 2004. After I was told that their greyhounds never left the building, they began using volunteer walkers to walk the dogs. Soon, some of those walkers became disillusioned and contacted us about what they saw. They were ultimately all fired and replaced with a hired dog walker. 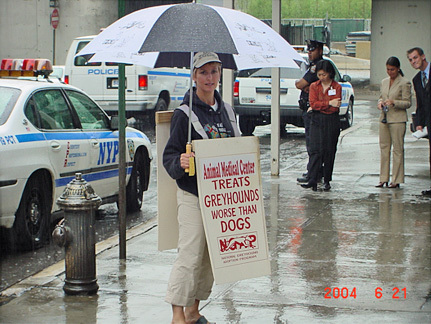 From the beginning, I knew the only way we could get the greyhounds out of the AMC was to prove that they were potentially doing something wrong or illegal. We noted very early on that they did not want to communicate with me. I will write separately about the demonstration that we held at AMC in July of 2004. I will write about my confrontation with them in 2006 at the North American Veterinary Conference, as well as all our interaction in 2007. In 2008, we became very lucky and were able to get three greyhounds out of the AMC's facility. I will write about that in length as you follow the story, but using their tattoo numbers we contacted the owners of these greyhounds and found that they had never given permission for their dogs to be used as blood donors and thought their dogs had been put up for adoption. Both Grateful Greyhounds and the Animal Medical Center had those dogs under misrepresentation. Misrepresentation is illegal and, following the rules of the State of New York, we were required to notify both Grateful Greyhounds and the Animal Medical Center of our intention to file an action against them. After several attempts, we spoke with Dr. Jeffrey Klausner, CEO of the Animal Medical Center. Even from the beginning, what he told me did not add up with facts that I already knew. As of the date of this writing, we believe that most of the greyhounds have been released but we have no direct evidence of that fact. They currently get all of the blood they need from an outside source â€“ this we know that to be a fact. However, we believe that some of the greyhounds are still there, designated as â€˜lifers'. One was seen walking with an AMC staff member as recently as August 14, 2008. Dr. Klausner has chosen to break off all communication with us and has refused our offer to take the remaining greyhounds into our facility. We have several options, this web page being one of them, to communicate with greyhound adopters, breeders and the media to voice outrage over the continued activities of the Animal Medical Center. In their eyes, they just wish to be defiant and above it all, as has been explained to us by so many veterinarians that were previous residents at the facility. No one wishes to challenge the AMC, not the Mayor's office, not the ASPCA - only NGAP. The information in this section will eventually include all of the communication between NGAP and the AMC. It will begin with the below photo. Please check back frequently as we add blow-by-blow descriptions of the events that have taken place over the last several years and feel free to forward this information to whomever you believe can help us free the remaining captive blood donor dogs from the Animal Medical Center. PHOTOS: NGAP had seven demonstrators arrive at the AMC only to find barricades all over the street and about three policeman for each one of us. I guess we were considered a threat! The people that you see standing out in front of the AMC behind us were actually executives who were there to meet their clients and whisk them by us. As you can see, it was raining, but we had our greyhound umbrellas with us. 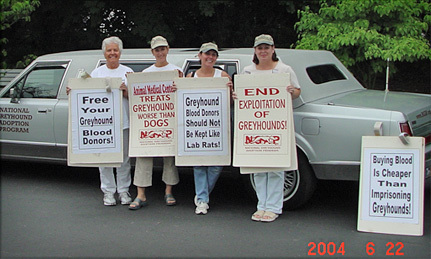 One of the photos shows our donated 1987 greyhound limo that escorted us to New York. We need to do this more often!